This week has seen many things happen in my life in Seville and therefore has inspired many different ideas on what to write about. With this in mind I have thought to once again shake things up by doing a two part blog post for you to enjoy. The first will address another third of my blog’s three part title (see my post on Flamenco from a few weeks ago) while the second is more of a cautionary tale on what happens when calendars are not correctly adhered to. Churros. Often found on Spanish or Mexican themed restaurant menus in the desert section, they are deep fried bundle of happiness usually served with a chocolate sauce or ice cream. If you find yourself at a particularly splendid fun fair or fireworks event you may well come across a stall selling them as a warming treat. Prior to my arrival in Seville, during the language and cultural preparation course me and my friends were on as part of the Leonardo scheme, I was delighted to learn how the Spanish people view these tasty delights. In Spain, Churros are not looked at as a desert or festive treat – they are a breakfast. Moreover, a glorious breakfast of deep fried batter and chocolate that will keep you going through even the most arduous of days. 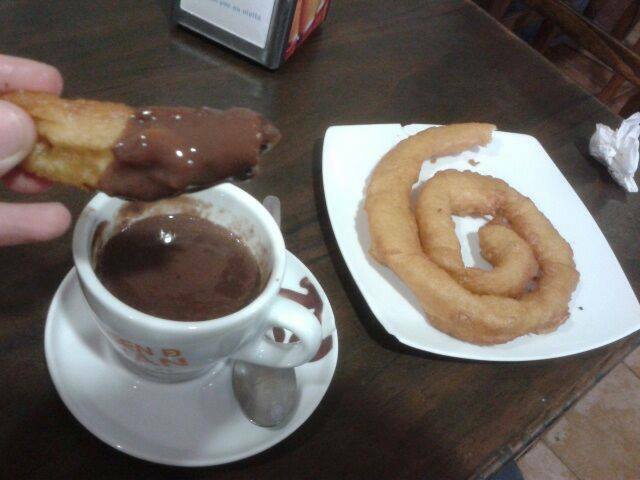 Churros con Chocolate are frequently only found on the menus of cafés during the morning time and it is a specifically advertised outside if they can still be eaten during the afternoon. When roaming the streets of Seville after around midday looking for Churros, be sure to look out for signs reading “Hay Churros en la Mañana y Tardes” which means that you will not receive a strange look for ordering a breakfast food outside of breakfast time. Think about the scene in Silver Linings Playbook when Bradley Cooper orders a bowl of cereal while out for dinner with Jennifer Lawrence. I feel that what the waitress must have thought in that scene is similar to what the waiter in the café in Cordoba must have thought of us when we found ourselves craving Churros in the afternoon. Churros, for lunch? Madness. On Thursday evening I realised that I made one of the most impressive organisational blunders of my life so far. Way back in September a friend of mine from England booked to come and visit me in Seville, thus guaranteeing that he had the time off work and I could organise to be free for the weekend in question. We fixed the dates and all was well. Or so I thought. A week before the planned visit I sent a message with instructions on how to get from the airport into the city centre, to which I received a reply that expressed excitement for the next day. This set the alarm bells ringing so I thought it best to confirm that we were indeed talking about the next week and not TOMORROW. I scrolled back through our messages to find that I had indeed recorded the wrong date in my calendar and had even arranged my work to have days off around the wrong weekend. I came to forgive myself for my administrative faux pas and prepared myself for my friend’s visit with less than twenty four hours to go. Aside from being at work for a few hours each day of his visit, I am proud to say that it was not the disaster I had first envisaged upon realising that I had been a week out of sync with the plan. My mum has kindly offered to give me a Battersea Dogs and Cats calendar when I return to England but I feel I first need retrain myself in the art of the calendar and perhaps also the art of reading numbers. I also now need to plan what to do with the (wrong) long weekend that I organised so long ago. As always, the marvellous place that is Seville and the area beyond has a wealth of potential so I’m sure it will be time well spent. Until next time, reader. Anyone for Churros?